Notice that Jesus doesn’t tell the disciples to make converts, or even to make Christians; they are to make disciples. And there is the problem. For the one thing that churches, of all spiritualties, have struggled to do throughout history, is to consistently make large numbers of disciples. However, the Spirit of God is doing something remarkable in our time. Across the whole of the Christian Church there is a renewed focus on discipleship and mission. The World Council of Churches recently put out something called the Arusha Call to Discipleship. In the Roman Catholic world in Pope Francis’ recent encyclical Evangelii Gaudium (The Joy of the Gospel) which calls for discipleship to be our primary focus. Closer to home, the Roman Catholic Bishop of Nottingham has recently expressed how he wants his diocese to respond to Pope Francis’ call. “I would like to ensure that people of all ages in our parishes, schools, and chaplaincies are helped to discover, or discover more deeply, the importance of a personal ENCOUNTER with Christ; so that they can become convinced that they are each loved by God and are invited to grow in their relationship with him. Because of that personal encounter with Christ, I would like to encourage each of us to hear and respond to his invitation to be his DISCIPLES, to follow him more closely, and to seek to serve him generously in our daily lives. In our own Anglican church, we have seen the recent publication of the ‘Setting God’s People Free’ report. This report is a clarion call to put discipleship and mission front and centre. In our own diocese, Bishop Martyn’s recent initiatives are all seeking to follow the impetus of this report. Now it cannot be an accident when Churches across the world and across the broadest spectrum of spirituality are all converging on the same call to make disciples who are on mission with God. Someone once told me that the Christian life can be summed up as praying for the Holy Spirit to move, and then when He does, trying not to fall off! So if the Holy Spirit is moving across the whole world calling the people of God to put discipleship front and centre, how can we join in with what God is doing, how can we join in with making disciples? and they came to him. If we consider this passage about the calling of the first disciples, I think we can see 4 elements that show us how disciples are made. And perhaps that is something we need to state right at the start. Disciples are only made intentionally – they don’t happen by accident. then you probably won’t make any. So how does Jesus go about intentionally creating disciples? The first element is having a sense of Jesus calling us to follow Him and making a response to that call. ‘(Jesus) called to Him those He wanted and they came to Him’. As churches cannot make disciples without being intentional about it, neither can we become disciples without a chosen and serious engagement. There is a sense here that these followers of Jesus allowed Him to interrupt and re-orient their lives. They chose to centre their lives on Him. Their relationship with Jesus would no longer be peripheral, some vague and sporadic meetings, but rather it was to be at the very centre of their lives and their primary concern. How central is Jesus in our lives? How far up our list of priorities does Jesus come? These would-be disciples were called to spend time with Jesus, and this in community. This is what is going help them to become disciples and this is what will enable them to go out on mission. This is a key fact about discipleship, it only happens in small groups, or one to one. It almost never happens in large assemblies of people. That’s because discipleship is more like a virus than a training programme. You catch it from someone that has it, and in order to catch it you have to live in close proximity to them. A man joined a fresh expression that my wife and I led. He had been an Anglican his whole life, but to be honest he’d never really connected with the spiritual side of things. Like most blokes he was happy doing the practical stuff. He was certainly always ready to help others with their car problems and DIY, but the spiritual practices – prayer, engagement with the Bible, had never really been his thing. With the result that he was a kind helpful person, but not an effective disciple who could lead others to Jesus. He couldn’t really talk about his faith, he didn’t really know how to pray. He was a cultural Christian not an engaged disciple. He and his wife started to come to our fresh expression of church – primarily because it was a warm friendly group of people who had fun together, who supported each other, and who shared their lives with each other. And as they grew closer to this group of people, things started to happen. When we decided as a group that we needed to start praying seriously for our community, this man and his wide came along to the prayer times. We would introduce a topic for prayer for our community – perhaps local businesses, the schools, sports clubs etc. and we would pass a holding cross around the group. When you received the cross, it was your turn to pray. We made it clear that you could pray silently, or out loud. The first few times this guy prayed silently, but after a while, hearing others pray, he gained confidence and started to pray out loud. I don’t think I’ve ever been so overjoyed to hear a prayer. Not because it was an eloquent, impressive prayer, but because it was a real step forward in this guys practice of his faith and his prayer – however inarticulate – was genuine expression of his heart for his community and a desire to see God’s blessing upon it. Over the months and years that followed, this man’s faith grew through the support and encouragement of the fresh expression community. He started to have spiritual conversations with other dog walkers that he met, simply sharing his faith when there were opportunities. He even grew in confidence enough to start leading sessions of the fresh expression. How did that all happen? By being part of a small group with some mature Christians in a space where spiritual practices were engaged with in an accessible and non-threatening way. So the discipleship question is, where are the spaces in your community where people can grow in discipleship through engagement in the spiritual practices – prayer, engagement with the Bible etc. with a small group of Christians? Do you remember at Primary School taking part in ‘Show and Tell’? You brought an object to school and then told your classmates the story of the object – here’s a shell I found on the beach on my holiday etc. Well when we are sent out to preach we are sent out to ‘Show and Tell’. We Show by our life, and we Tell by our conversation. The Early Church saw rapid expansion before there were structures, training centres, professional missionaries, even church buildings. Why? Because ordinary Christians lived differently to their neighbours. They were loving, kind, they shared together, they looked after the poor and oppressed in their communities. Do you see here how the ‘show’ and the ‘tell’ of Christian witness are intertwined? A life which demonstrates the kindness and generosity of God provokes questions and these questions give an opportunity for witness to the difference Jesus makes. The greatest weakness in the Christian Church is that we often separate the ‘showing’ of the faith and the ‘telling’ of the faith. Some groups are very good at showing Christian love in service to their communities, but they never get around to sharing how these actions are an expression of their faith in Jesus. Other groups are very good at telling people about what they believe, but they don’t demonstrate it in generosity towards, and loving service of, those around them. In Leicester Diocese we are trying to hold both the showing and telling of gospel proclamation together. Bishop Martyn’s ‘3 Questions’ challenge us about growth in numbers of disciples, growth in the depth of our discipleship but also about growth in loving service of the world. So the discipleship question would be, are we showing the love of Jesus in concrete ways to those outside of the Church and is that accompanied by an explanation of why our faith motivates us to this action? The fourth and final element of Jesus’ discipleship model is seen in the spiritual power that is given to them. Those who have grown in their relationship with Jesus through putting Him at the centre of their lives, who have developed through spiritual practices in community, who have been obedient to the call to go out and preach the gospel in word and deed, these people are imbued with spiritual power. The reality of our lives is that we are in a spiritual battle for people’s souls. We are fighting against determined opposition to establish the Kingdom of God in a hostile world. You can only do that effectively when you have spiritual power. You can only be filled with God’s power through a life of discipleship. Have we heard Jesus’ call to come to Him, to make Him the centre of our lives? Have we responded to that call? Are we engaged in spiritual practices with a small group that will enable us to grow in our faith? Are we engaged in a life that preaches the gospel by word and deed? Is the power of God’s Holy Spirit evident in our lives bringing change, destroying that which diminishes human life and establishing the kingdom of God? In this time of Lent may God enable us to examine our lives and the activities of our churches and respond to this world-wide movement of the Spirit of God to place the creation of disciples at the centre of all we do. May God help and bless us all. There is something fundamentally true in this statement. Indeed I think it can be stretched our further. Every day we are making the people around us better or worse. • Congratulating on the development of new competencies. • Indicating areas where improvement is possible. These are not things strangers can generally do for each other. To be criticised is a painful existential experience. To have some part of yourself held up to scrutiny and exposed at weak and wrong, can only be borne when the person doing so has earned the right to do so. A right they can only earn through proving consistently and convincingly their esteem for us. In which case their motives can at least be hoped to be pure – that they want our best – rather than being unworthy. This process transforms not only individuals but their communities and societies. When this process is absent, we make no forward progress in becoming a nobler, better person, in fulfilling our human potential and, at best, individuals and communities stay as bad as they are. In the worst case scenario, in the presence of negative character reinforcement – applauding that which is base and poor and deprecating the good – we quickly take each other and our community into the deepest experience of hell. So how do we choose to live? Will we establish ‘sharpening’ relationships, invite mutually close observation and truth telling, in the hope of growth and advancement in character? Or will we avoid the pain, difficulty and discomfort and accept the status quo? Or will we embrace a pathology of mutual negative reinforcement that will take us all to hell? The choice and the consequences are ours. There is a discourse of Jesus that takes a rather surprising twist. Ask the Lord of the harvest, therefore, to send out workers into his harvest field. The last three sentences of this are very unexpected. But, surprisingly, these two lines are separated by a rather incongruous and unexpected exhortation to prayer. Indeed, if this line about prayer was missing and we had to complete Jesus’ words, I doubt that any of us would complete it in the way that Jesus does. So why this interjection about prayer, what is Jesus telling us by including this unexpected phrase? 1 Whose harvest it is. The harvest belongs only to God. Human beings should not presume to try and take the initiative and control how the harvest is gathered, nor who gathers it. This is God’s harvest; we need to follow His leading and guiding. 2 Those gathered, are gathered by grace. Harvesting souls into the Kingdom of God is a divine act and one that is dependent upon miracles of grace every step of the way. Those who turn to Christ need a miracle of grace in their hearts and minds; grace to enable them to perceive the spiritual truth about themselves and about Jesus and grace to enable them to receive that revelation and to respond in saving faith. 3 Those who gather, gather by grace. Not only are those who are to be brought into the harvest totally dependent upon grace, so are those who gather the harvest. Every messenger of the gospel, every gatherer of the harvest, is likewise a miracle of grace. No one involves themselves in the work of God, other than God moves in them by His Spirit. No messengers send themselves out, rather they are sent out through a divine stirring, calling, commissioning and sending out by God. 4 The gathering is dependent upon grace. The gathering of the harvest is also totally dependent upon grace. Those who are sent out need to be indwelt by the Spirit of God, who will then call and motivate and drive them to mission, who will enable them to proclaim the good news about Jesus, and who will anoint their proclamation with evangelistic power for the transformation of lives. Mission is therefore completely different to every other human endeavour. In most human activity effort, technique, skill, hard work, and good methodology will more or less guarantee you positive results – not so with mission. In mission nothing we can do has any efficacy in and of itself. A positive outcome in mission activity is entirely dependent upon God, in His grace, sending forth His Spirit; something we can neither predict nor control. In this passage Jesus is therefore telling us something very profound and surprising about the nature of mission. Jesus reveals that mission is a mystical, mysterious activity. An activity in which God invites us to participate – and we do so in a meaningful way – and yet there is a degree to which we participate in a rather clueless, befuddled and uncomprehending fashion. This reminds me of an experience I had at school. At school I really struggled with maths and I remember learning about quadratic equations. I didn’t understand the concept. However I did manage to work out that if I had a string of numbers and letters in a certain format, and I carried out certain manipulations on them, then that would enable me to get a string of numbers and letters in a different format, which would be the correct answer. But I had absolutely no idea of what I was actually doing, or what it meant! It was only when I got to university and studied maths as part of an engineering degree that I finally understood what those strings of letters and numbers meant and what the manipulations were doing and what the answer signified. Our involvement in mission is rather like my schoolboy maths. Most of the time we have little comprehension about what we are involved in, what might be happening, or how God is working through us. There is deep mystery built into the heart of mission and we are required to embrace it. The Lord of the harvest works as He wills and our involvement is merely to pray for the workers to be sent out, and to hold ourselves available and obedient to His call when it comes to us. We just obey – God does the clever stuff. I‘m not a natural athlete. 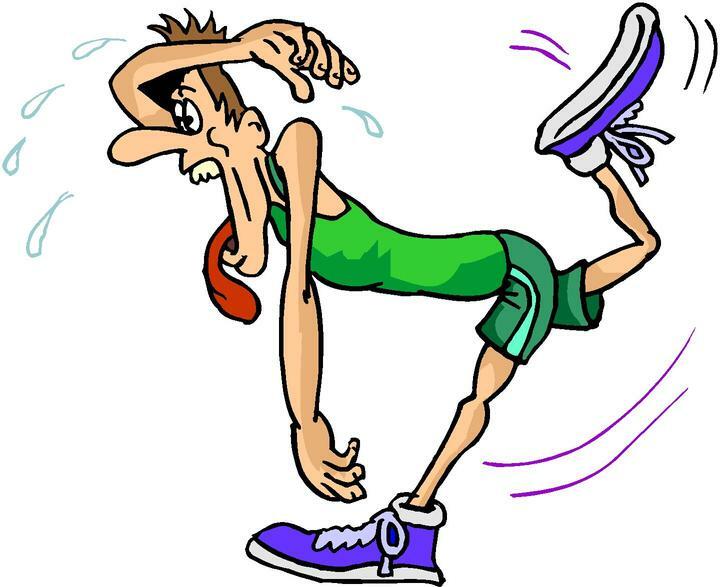 I can run, but it is hard work and it is not pretty to watch. Out for an early morning run today I met several dog-walkers along my route. Some of the dogs were running too. It was amazing to see how fast they can run. It doesn’t look like it is hard work, or an effort for them. It looks more like a joyous expression of their nature – the Franciscan in me would say that it was a physical hymn to their Creator. As I contemplated this it struck me that in nature animals get good at the things that keep them alive. Dogs can run because this was essential to their ability to catch food, to survive. Of course man has interfered with this ability somewhat. We now have dogs that have been bred to have certain bizarre physical characteristics. There are dogs with short legs which are able to go down rabbit holes and badger setts. I saw a corgi the other day – a dog with 2 inch legs. A dog for whom an inch of snow is a deeply unpleasant experience – especially for male corgis – no wonder they tend to be bad tempered, I think I would be too. But dogs in the wild can run and run fast – for that is what enables them to survive. The reason the deer pants is because it has just been running for its life. Its ability to run is the only thing that keeps it alive. At the limit of exhaustion and endurance it seeks the water it needs to enable it to continue, to survive. It is only when we understand the nature of our spiritual life in this way, that we will really seek God with the kind of earnestness that is appropriate, as something vital in our life. Only then will we understand our relationship with God for what it truly it – a survival issue. I love the Don Quixote books by Miguel de Cervantes. The author himself was almost more amazing than his fictional creation. Having lost the use of his left hand in a military battle, he simply recovered and re-enlisted! Only having one hand was not going to stop him fighting! He was later captured in battle and spent five years in captivity being held for ransom. He led an escape with his fellow prisoners but after a few weeks hiding out whilst trying to send for help, they were betrayed and re-captured. His family finally paid the ransom, which left Cervantes enormously indebted. He tried to write his way out of debt but was only intermittently successful. Hs book Don Quixote, is the last book of the medieval age. In it Cervantes looks over his shoulder wistfully at the glories of the medieval age – valour, chivalry, duty, romance (in the fullest medieval sense of the word). The world Europe was becoming – a world of lace-draped courtiers, hangers-on, flunkeys, sniping gossip merchants fighting for courtly favour and advancement – was anathema to Cervantes, the man of action. 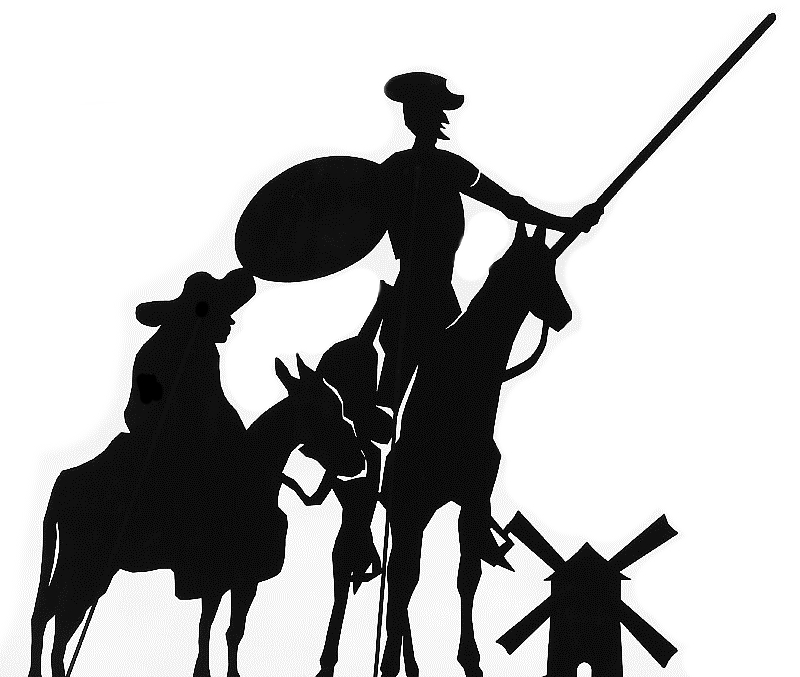 Don Quixote is a love poem to an age that is fading, whose glories are passing, a red-blooded age which is being replaced by something pitifully anaemic and colourless. There are many things that I find inspirational in Cervantes’ book. One in particular is the name of his horse. It is a rather bedraggled, knock-kneed beast, past its prime. Yet on embarking on his quest Quixote gives his faithful old nag a new name. He calls it “Rocinante”. It is a play on words for in Spanish “Rocin” means “an ordinary horse” – nothing special, no qualities that would give it value or significance – the suffix “ante” means “formerly”. So “Rocinante” means “Formerly, an ordinary horse”. There is something in this that deeply moves me. There is the idea of anticipation, of hope, the conviction that whatever the quest may bring, even the mere fact of engaging on it is, in itself, somehow decisive, honourable, and glorious. What the horse used to be counts for nought, it is on its way to becoming something new, as yet unknown, its qualities and capabilities are about to be revealed. Of course, you can see the resonance that I find here with the Christian faith. Once we engage with Christ we are a new creation (2 Corinthians 5:17), we set on a journey that has our total transformation as its goal (2 Corinthians 2:18). What we were, the old limits, failings, weaknesses no longer apply. It is Christ’s own life in us that is determinative of what we shall become. As we cooperate with Him there is no limit to what the divine life, flowing through, us can achieve. Interestingly, the Bible also speaks of us being given a new name, a secret name, a name only known to us and to God but which will perfectly express the essence of our identity. This name is not given at the start of our adventure, but at the end. As such it is not so much the hope but rather the reward, the concrete expression of all that God has worked in us. Maybe for someone, that name might just be “Formerly an ordinary man”. I have discovered that the tortoise has a lot to teach us about the Christian life. Let me start this reflection with a story. My Mom and Dad once moved into a house and found that the previous owners had left behind a rather odd garden ornament – a life-style and very realistic model of a tortoise. Now, my mother has a somewhat twisted sense of humour and the temptation to have some fun was just too great. She put this tortoise in the front garden, where passing neighbours would see it and every day she would move it just a few feet. It gradually became an object of fascination to the neighbours who couldn’t quite make up their minds whether it was a real tortoise or not. Couples would stop and begin arguing amongst themselves, one pointing out that it was over there yesterday and the other saying look it’s clearly just a model. And my mother would be peeking out from behind the curtains doubled up laughing! Just to ramp things she started putting bits of lettuce out in front of the thing, with nibbles taken out of them! It went on for weeks! What made it such an effective prank was that the difference between a live tortoise and a dead one, is actually very little. As I reflected on Mom and her practical joke I thought there is quite a lesson here about Christian spiritual life. A lot of Christians are a bit like the tortoise – not much in the way of evidence of life, not much growth, not much movement. They are actually alive, they have been born again by the Spirit of God, but there’s not much evidence of that divine life flowing through them. In fact they look rather dead. I have to be honest here and say that this was me for quite a long period in my Christian life. Alive but rather dead looking. Jesus didn’t send his 12 Apostles out into the world in order to make Christians, he told them to make disciples. The goal was not about saving souls but creating a community of people who lived differently. Discipleship is the on-going and life-long process of cooperating with the Holy Spirit so that every area of our lives can be transformed. Every aspect of our lives has to be held up to divine scrutiny so that we can see is it rightly ordered, rightly prioritised, rightly focussed, rightly pursued? Which sounds like (and is) hard work. However it is also joyful work. For God calls us to make these changes in order that we might draw closer to Him, experience more of His love, be more involved in His activity – all of which is the greatest joy and privilege a human being can ever experience. So the challenge of the tortoise is to examine the state of our spiritual lives, and if necessary to shake ourselves up, to knuckle down, to go for it, to embrace the challenge and adventure of Christian discipleship. The second spiritual lesson that we can learn from the tortoise concerns its defence system. When the tortoise gets into its defensive posture it is pretty hard to hurt. When it pulls its head and its legs inside its shell there is not much you can do to it. It is pretty safe. The big disadvantage that it faces in this defensive posture is that it can’t actually do very much, anything even. It can’t see, it can’t hear, it can’t move, it can’t eat, it can’t drink. All pulled in and huddled up it’s safe, but actually in that position it is also rather pointless. In our Christian life there is often the temptation to be a bit tortoise-like – to withdraw when things looks a little threatening, or scary, when they require us to venture a bit outside of our comfort zone. John Cleese once said that it was each Englishman’s goal to get safely into his grave without ever having been seriously embarrassed. I can relate to that remark! However if we are to be of use to God then we are going to have to take risks. If we are going to move where God wants us to move, say what God wants us to say, do what God wants us to do – we are going to have to take risks. And yes, there may well be moments of embarrassment along the way! But wouldn’t you rather be doing something risky which counts for eternity, than being safe but pointless? The final lesson we can learn from the tortoise is related to its lifestyle. A tortoise strikes me as rather an odd choice of pet. I mean you buy them, give them a kind and loving home and they then have the audacity to spend half the year asleep! They just go into hibernation, close down for months on end, and enter a kind of half-life stasis. Looking back on my own Christian life I can recognize periods when I did this spiritually. I just closed God out. Shut things down. I went into a kind of spiritual hibernation. During these times days, weeks and months were just wasted because I wasn’t alive to God, listening to Him, available to Him. Don’t be alive but dead looking. Don’t choose safe over useful. Perhaps the greatest gift that poets and artists give to us is the ability to see familiar things in new ways. In so doing they give us the gift of newness and freshness, they restore to us the vitality of our familiar possessions. The description “this life-giving, holy and terrible sign” had such an effect on me. The writer, Joceline of Furness, a 12th century monk, used this phrase to describe the Crosses erected by Saint Kentigern everywhere he took the gospel to people. There is a paradox in that this Roman instrument of torture and execution has been turned around by God and now becomes a source of life and healing. Doesn’t that just sum up the Christian faith! The cross is the instrument by which God both showed us the awful enormity of our sin and also dealt with it, once and for all. After the cross event there is only one kind of sin in the world – forgiven sin. We just need to receive this forgiveness which is freely offered to all who will take it. We take off our shoes and fall on our faces, this is sacred ground. This is used in its arcane meaning indicating that which inspires awe, which is of great seriousness or extreme. As I read on, it was interesting to read why Saint Kentigern erected these crosses. The first reason is that of spiritual warfare. Christ’s victory is the only victory the Church has, or needs. It is only in presenting the reality of this victory to the dark powers that we defeat them. The cross is a rallying point, the reminder of our unshakeable victory, already won by Christ. The battles we find ourselves in might be fierce, but the outcome of the war is never in doubt. 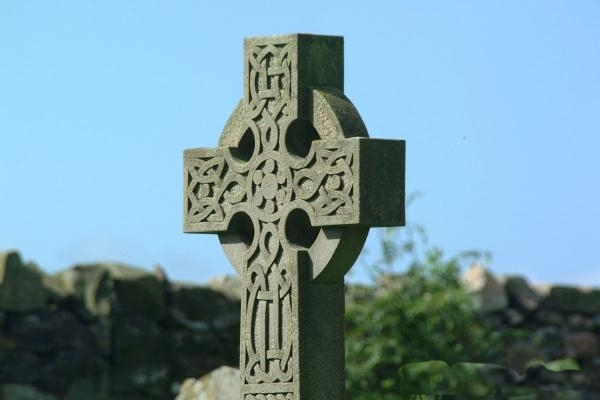 The cross symbolises all that is central in the Christian faith; all that is precious to the faithful. Looking to the cross, signing oneself with it, have been basic elements of Christian spirituality since its first days. They are weapons in our warfare. The calling and duty of the followers of Christ is to respond to their Lord’s crucifixion with their own. We are called to kill in us all that is unworthy or opposed to the life of God in its radical holiness. As Constantine was told in a vision, “In hoc signo vinces” – In this sign you will conquer.